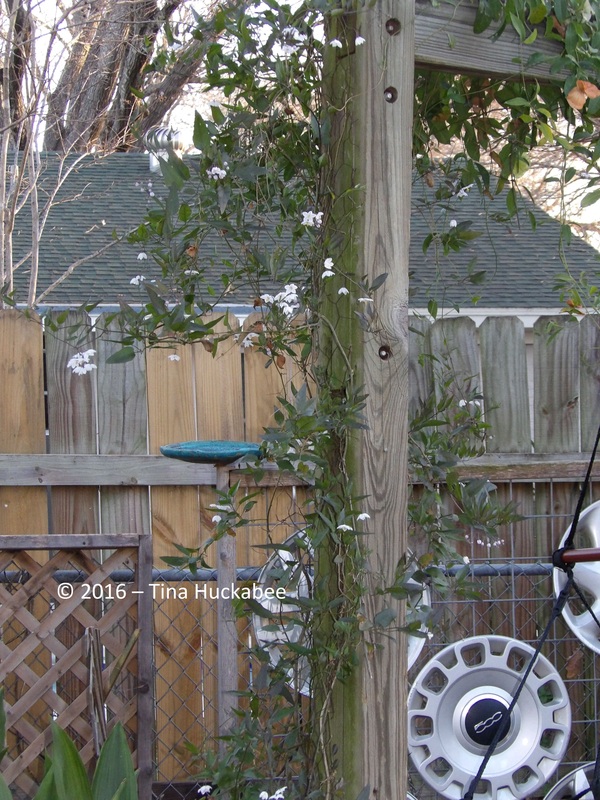 As winter seems a no-show this year here in Austin, Texas, there are plenty of greens, partial greens, as well as blooms in my garden this February. Two of the green things twine along this swing beam, which we built long ago for a playscape, but was re-purposed into an adult weekend snoozing spot. 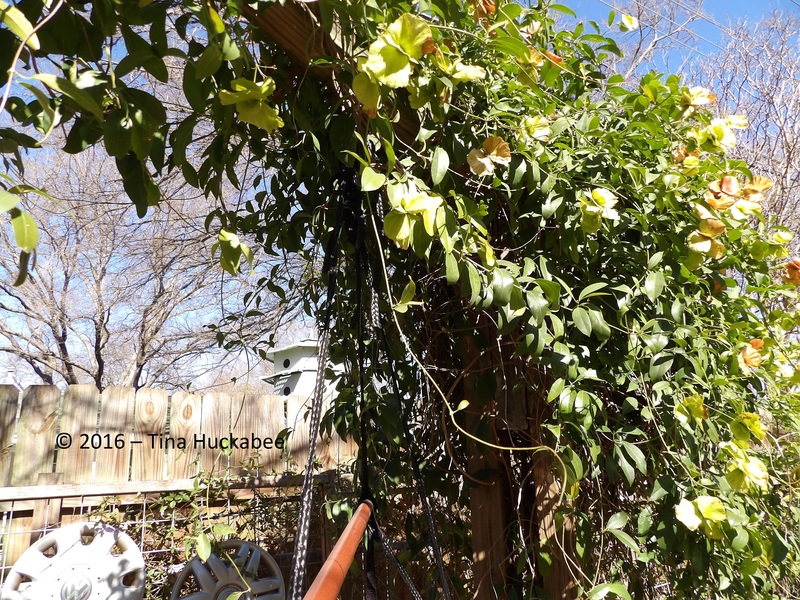 The vines draping the frame are Potato Vine, Solanum laxum on the left side, and Mexican Butterfly Vine, Mascagnia macroptera, on the right. 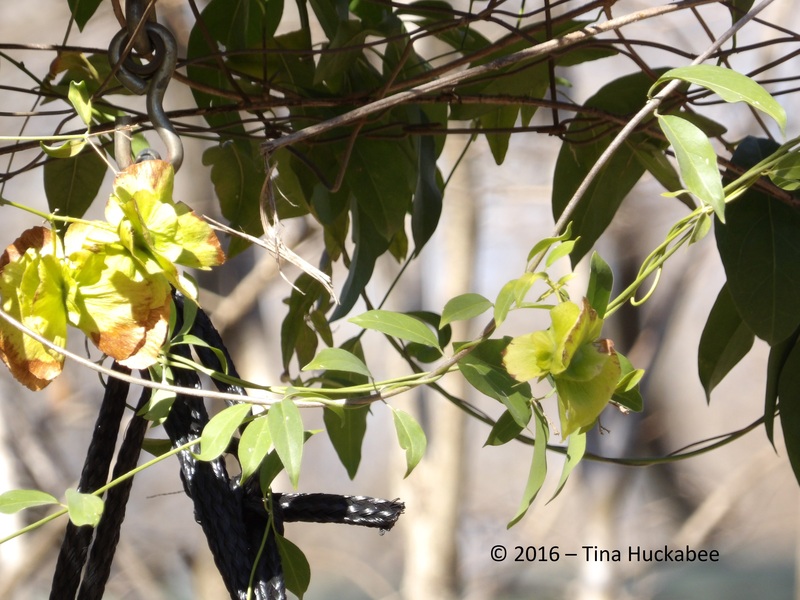 The Potato Vine is at its blooming best in fall, winter, and spring. Our summers are too toasty and dry for the blooms to peek out, though the foliage remains green year-round. 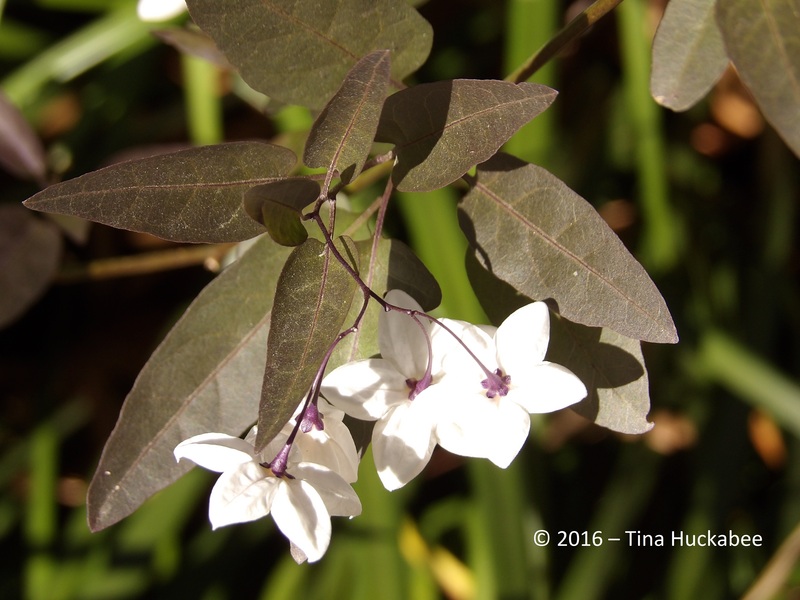 A dainty vine, it doesn’t get too big or full and never requires pruning. Once freezing temperatures arrive, the foliage develops a lovely burgundy blush. My garden hasn’t seen anything more than a glancing freeze this year, so the foliage coloration is more subtle this February. 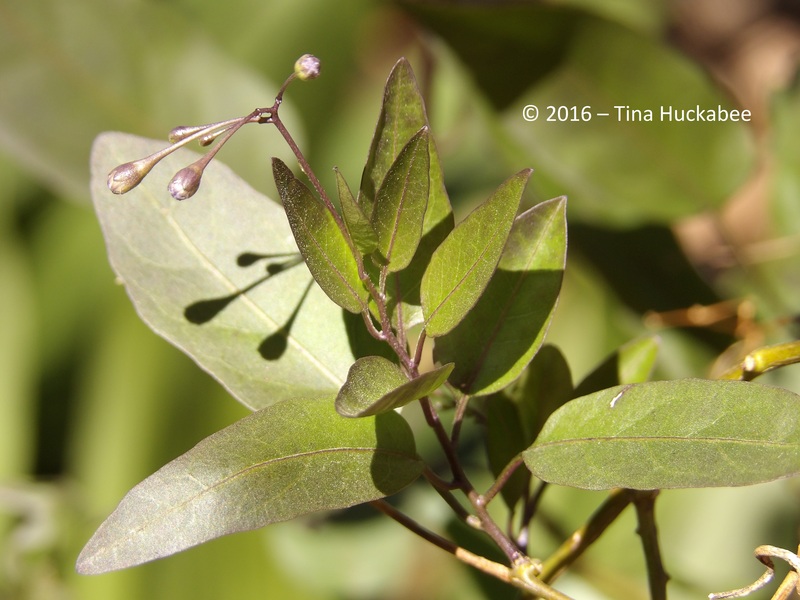 The peduncle, receptacle, and calyx mirror the plum purple in the foliage. The warm color provides a nice contrast to the winter white of the petals. 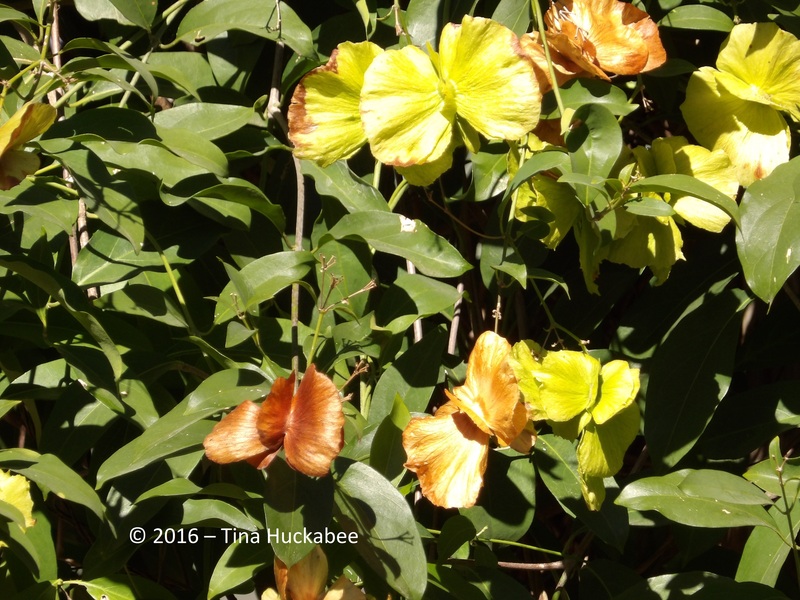 Conversely, the Mexican Butterfly Vine is vigorous grower and bloomer. 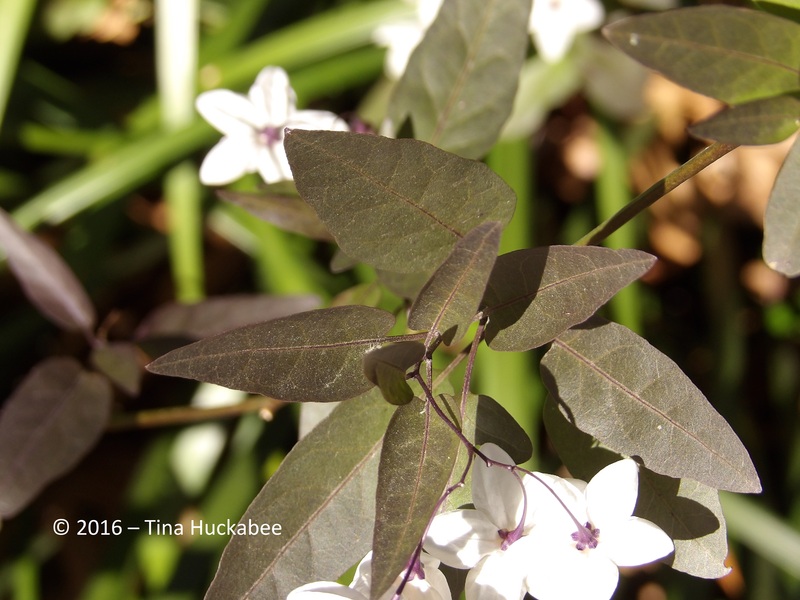 Like the Potato Vine, it is a tough and water-wise addition for any Southwest garden. 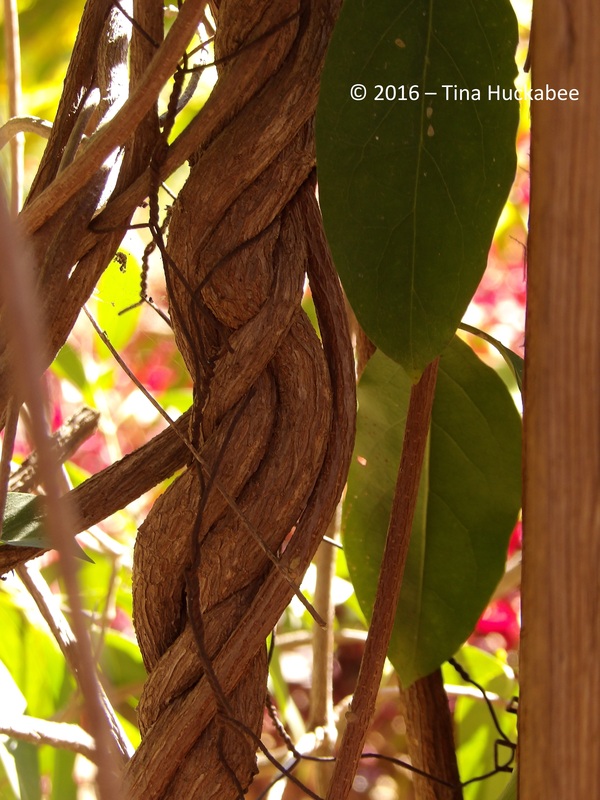 The strands of the vine grow continuously and I frequently weave them into the full parts of the plant, like errant bits of hair needing tucking behind an ear. 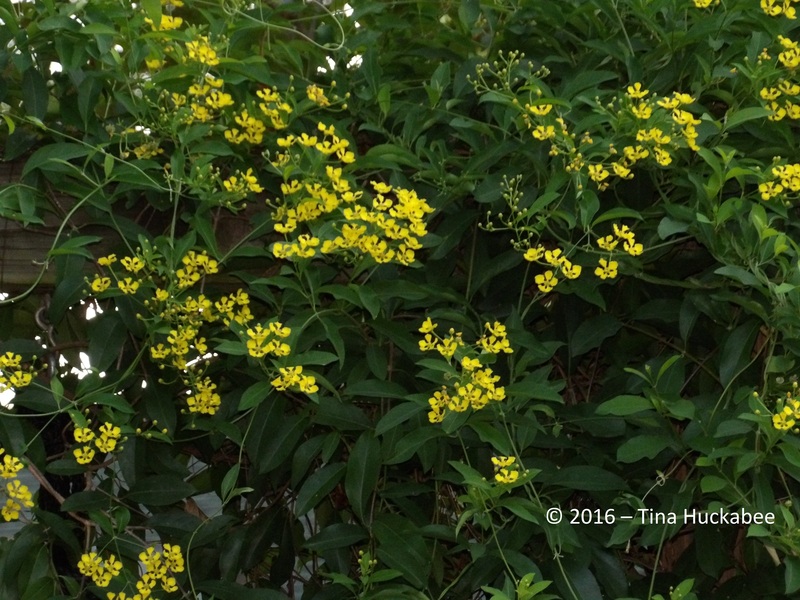 While not flowering now, clusters of bright yellow blooms grace this plant during summer and fall. The vine appears to host multitudes butterflies, resting amongst the lush foliage. For obvious reasons, Mexican Butterfly Vine is a fun vine to grow in the garden, real butterflies or not! I planted the vine about 10 years ago. The trunk shows its age and twisty nature. 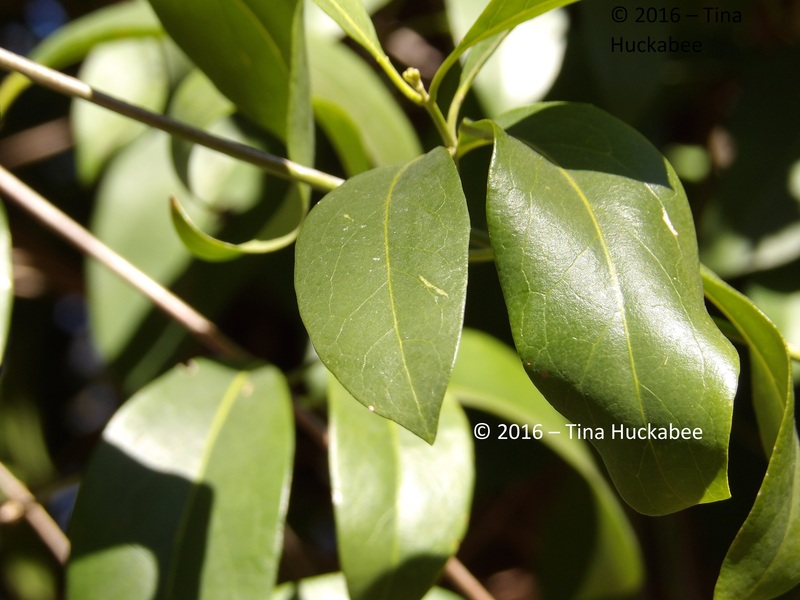 Most winters, the foliage of Mexican Butterfly Vine remains green, though it freezes back completely when we endure temperatures cold enough–well into the 20’s–and for a length of time. Even when knocked back completely by a hard freeze, it returns from its roots without fail. 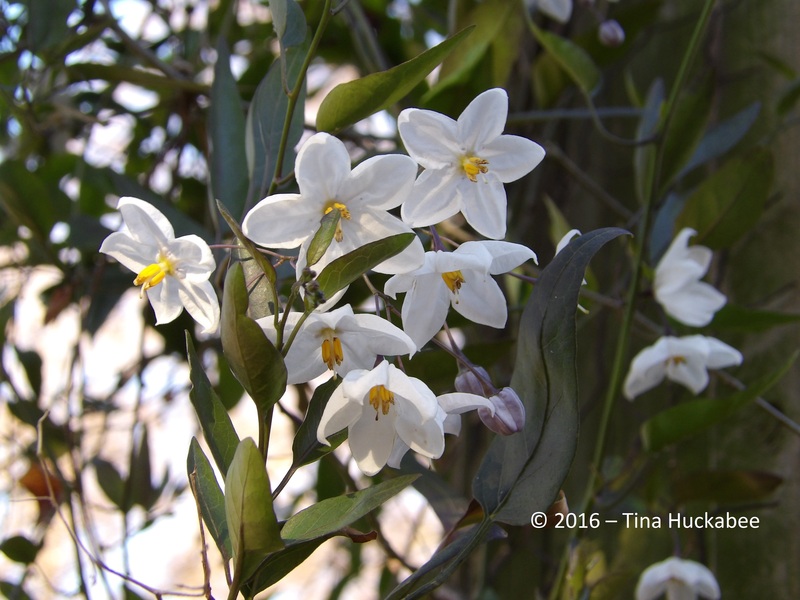 Both Mexican Butterfly Vine and Potato Vine are no-fuss and low-water needs vines, and provide year-round interest and beauty. This entry was posted in Mascagnia macroptera, Mexican Butterfly Vine, Potato Vine, Solanum laxum, Uncategorized and tagged GBBD by Tina. Bookmark the permalink. Very interesting post about your vines! Thanks, Lea!! You enjoy your blooms and bloom day too. I just love that Mexican Butterfly Vine! It should do well in my area, Ill have to explore it further. I always forget to write that I’m in zone 8b. The Mexican Butterfly vine is in no way invasive here, though obviously not native. Good luck! I had a potato vine growing on trellis in what was often a deeply shaded area, it eventually succumbed to being flooded during last year’s torrential rains… after years of barely making it. I’m determined to try one again in a sunnier area – the flowers were so lovely! 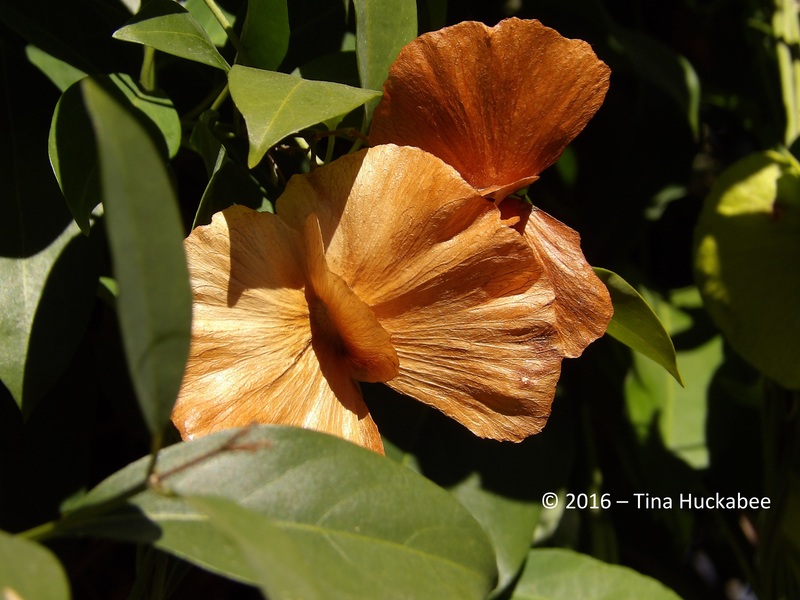 As to that butterfly vine – gorgeous! Two winners for sure! You know, mine doesn’t get all that much sun, except for winter time. It’s in the shade of a Shumard Oak and gets only dappled shade most of the year. 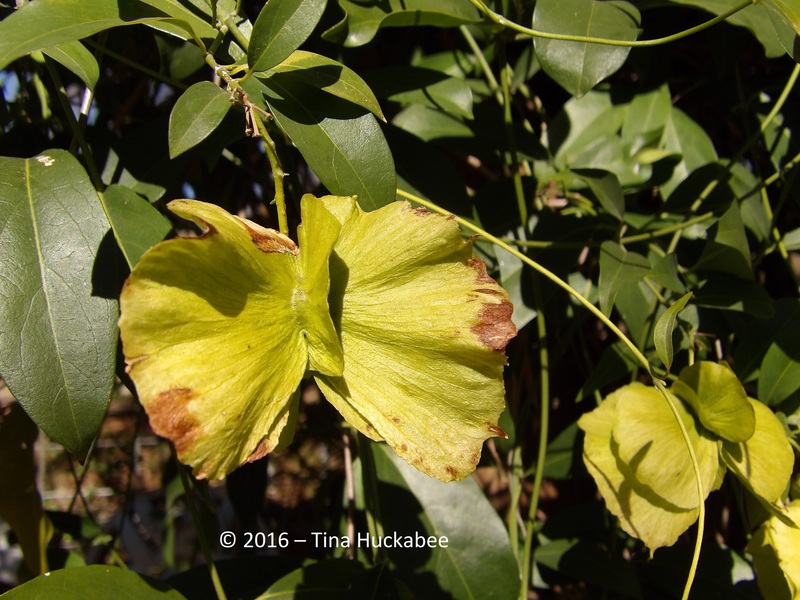 I first noticed this vine at Barton Springs Nursery years ago in a very shady spot, which is what piqued my interest in it. Try it in a sunnier spot, but maybe not too much sun! Keep me posted! 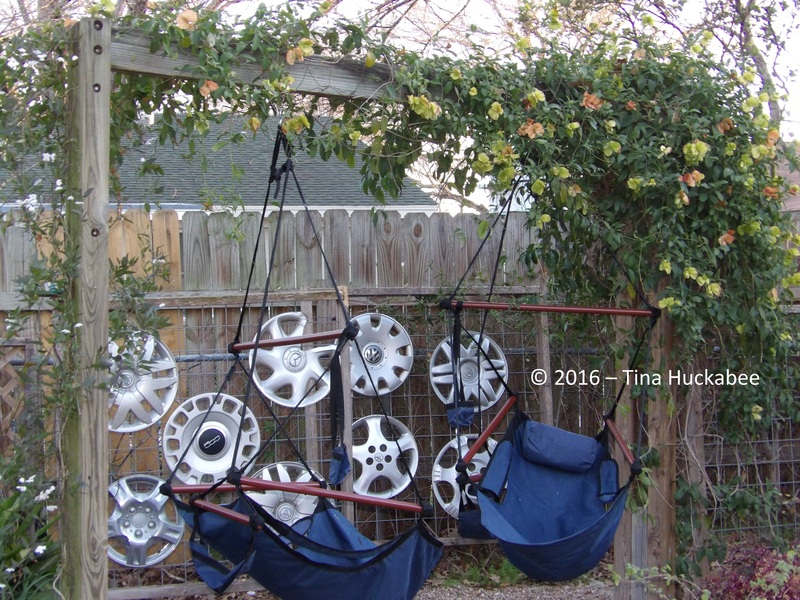 An adult snoozing spot sounds like a great idea Tina, especially in a place to admire your vines. We grew a beautiful Solanum here but high winds brought the whole thing down, yours inspires me to grow another. I am intrigued by your hub caps, is there a story there? I love vines. I have never seen this Mexican Butterfly Vine. I wrote down the name. Thanks for the introduction. You’re very welcome! I hope it’s something that you can grow, without problems in your area. 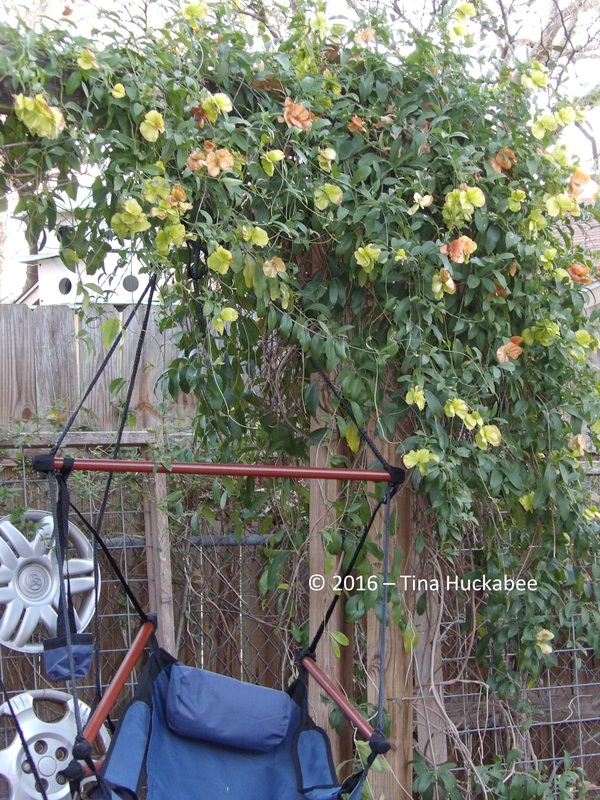 We used to have a butterfly vine. I enjoyed picking the “butterflies” to use in dried arrangements. For those who are good at crafting, the butterflies make great decorations to use. Alas, I’m not one of those people, but I have given some butterflies to others to use. Lots of fun! I’ve never seen these here. I love those big white flowers. 🙂 Winter was so slow to arrive in the Mid-Atlantic but it came in like a beast. We had subzero windchill this weekend and have about 4″ of fresh snow on the ground with freezing rain on the the way. But that’s ok. I like it when winter acts like winter. Your butterfly vine is spectacular. Mine only bloomed once. That’s a shame that is hasn’t bloomed more. You know, mine started of very slowly. I think it was several years before mine had much blooming activity, though it’s a consistent and full bloomer now, every summer. Thanks! Both vines are nice editions, trouble-free plants and pretty too! It doesn’t get much better than that in the gardening world. Oh, I like this post! And it makes me realize Austin would be a good destination for a winter trip one of these years. Your vining, twining plants are lovely! Yeah, we’re a little milder than Wisconsin! Actually, October/November and anytime in spring are great times to visit. Come on down! I think I saw the potato vine when we were in California. 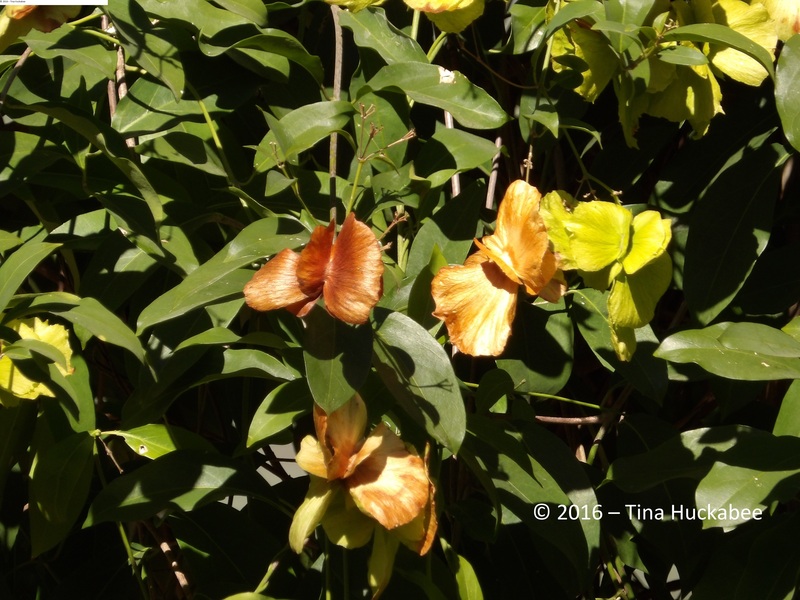 The butterfly vine really does look like a flock of butterflies! 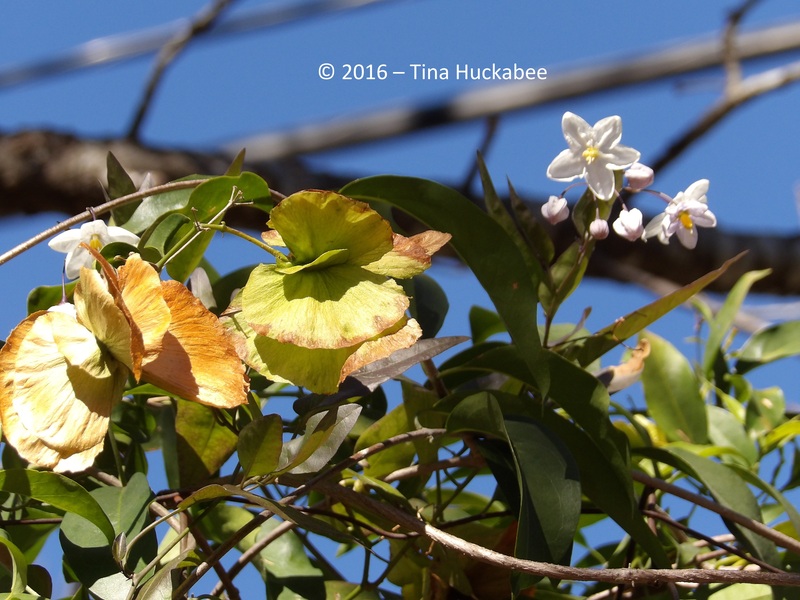 It wouldn’t surprise me if the potato vine grows in Cali–everything else does too! Aren’t those butterflies fun? Two new ones for me! I just love it reading about new plants even if I cannot grow them here. The Mexican Butterfly has most interesting and decorative fruits! Isn’t that Butterfly Vine great?? No, I imagine they’re too tropical for you, but like you, I enjoy reading about plants, whether I can grow them–or not! 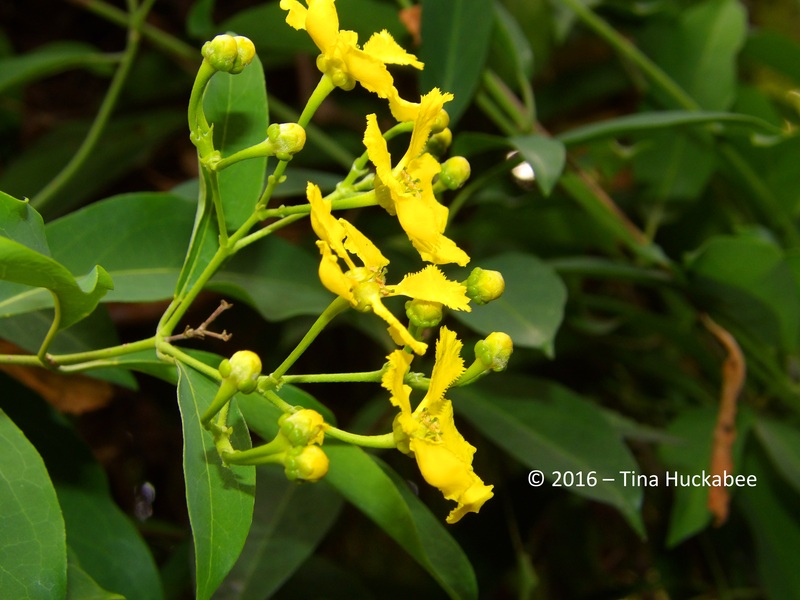 That Mexican vine is lovely, if it grows in Texas maybe it will also thrive here in the Philippines. I hope to see that too here, so i can make an arbor almost like yours. Presently, i have bougainvilla and now trying to let garlic vine grow fast in a trellis. It’s a beauty, Andrea. Do be sure to check that it isn’t invasive in the Philippines, though. Good luck!